Kyocera advanced ceramic blades offer a superior razor-sharp edge and retain their edge at least 10 times longer than other professional cutlery, including high carbon steel knives. The elements of Kyocera's advanced ceramic were formed in nature through thousands of years of crystallization, extreme temperatures, and tons of pressure. This combination results in a pure dense unrelenting material that is 50% harder than steel and second in hardness to a diamond. Kyocera ceramic knives are lightweight & perfectly balanced, reducing hand fatigue during repetitive cutting tasks. 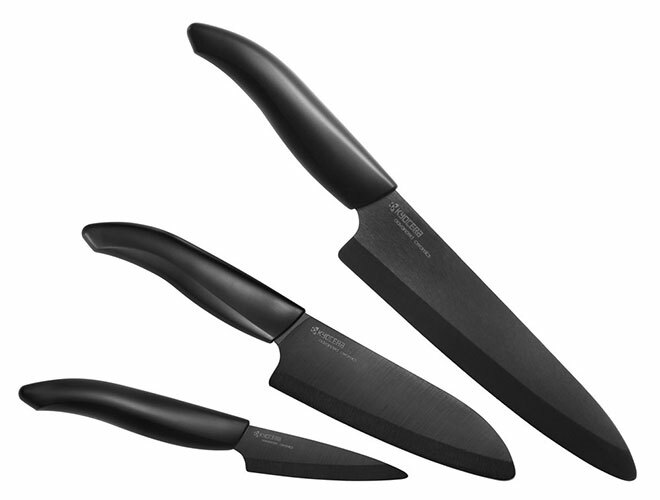 All of these features translate to a razor-sharp, strong dense blade that holds an edge longer than other ceramic knives. Hand wash only. Made in Japan.